A common theme running through the Biz Summit event was a focus on how startups and SMEs in need of financing can connect with investors. Pitches made by both 21Dojo and Pitchdeck & Beyond were obviously about what they do – which is to provide startup businesses the tools they need to create a professional and effective pitch to investors. 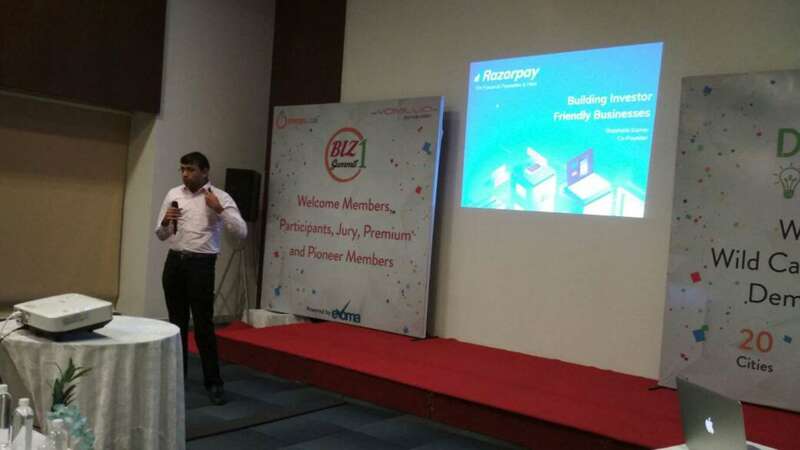 On top of that, there was also a well-received presentation on “Building Investor Friendly Businesses” by Razorpay Co-founder Shashank Kumar. Razorpay is an online payment gateway for Indian businesses that want to receive payments online. It offers hassle-free integration for merchants, and clean, developer-friendly APIs for those who want to implement their own payment solutions using this payment gateway. The video and transcript below explain in detail Shashank and his team’s experience and expertise in how to build an investor friendly business. Transcript: Title is little misleading – “Building a Investor Friendly Business”. You should not build a business for being investor friendly. That should not be the correct target to have. Build a business which makes sense to you and which you see yourself doing for few years. On the path if you think investment is necessary then go for it. Don’t think to create billions and billions and grow the business. That’s not right. Think of business which is there to stay. Razorpay is 3 yrs old company and is a totally Indian company getting strategic funding from large companies abroad. With no business background, we struggled a bit in starting. Let’s discuss in general how you go about creating a business startup. If you are doing a startup, you want to do a business which is going to grow fast and stay, have an idea which has potential to scale a lot. It can be on a path you are creating later. Eg: Microsoft – small programming language in 70’s, and they had an idea that this field will grow and they expanded. Mistake a lot of people do is creating a product and launching in few months and take lot of time for creating a perfect version. Go and start with few features or sample versions. We made a simple version and promoted to friends and co working space n social media and then they liked. So later we created final version on the feedback basis. Build MVP of product and sell to few people then with the feedback improve and make changes. Don’t get enamoured by the product – think about the business model and not product only. Keep an eye on the business plan and also future plan in mind. Think about ideas in business which will scale in coming time. We used to talk to each of our customers and ask for feedback. As we grew, we figured out what is easy and difficult to automate. At an early stage, always think how to give edge to your business that your competitor can not give. Perfect the elevator pitch – Doing a startup you have your idea in mind always. Don’t think that everyone knows about your domain. Be clear and defined about your thought. Pitch your company always to potential employees, investors, media, etc. Invest in team and culture. As company grows, who can replace you for certain tasks, and you focus on something else. Hire people to do the critical tasks. Frequently ask customers feedback. Speak to customers very often even after launching and scaling product too. Running a startup, make it as metric driven as possible. Track on week to week and month to month basis. Identify reasons why you are not growing and fix it. Identify a small niche and fill the gap in a way that you dominate the market over time. If you can dominate a very small niche, you will find it easy to grow and expand over time .